If the meat is in one big chunk, cut into cubes about 2 cm / 1 inch square. Pat dry with paper towels, and brown in a little oil on all sides in a frying pan. Set aside. Slice the onions thinly. Grate the ginger and either grate or finely chop the garlic. (A microplane is great for this task, if you have one.) Peel and cut the carrots into chunks. Don't peel the potatoes yet: this will come later. Heat your heavy-bottomed pot over medium heat, and heat up some butter, ghee or oil. (Butter or ghee will add some richness but oil is fine - you will barely notice the subtle difference since the curry will overwhelm it.) Add the onions and a pinch of salt, and lower the heat to medium-low. Now comes a period of long, slow cooking of the onions that can take up to an hour or so (the salt helps it along as it extracts the moisture in the onions). At the end you want to end up with a much reduced mass of onion that is a light caramel brown in color, as in the photo. Bring up to a boil, then lower the heat and simmer for at least 1 hour, or more if your meat is a bit tough. About 30 minutes into the cooking process, dry-roast about a tablespoon of garam masala powder in a small frying pan until it starts to get very fragant, and add to the stew pot. Add the carrots around then too. In the meantime, make the curry roux. In a small frying pan, melt the butter or ghee or clarified butter (note that ghee is basically clarified butter) and heat until any foaming subsides. Take the pan off the heat, and add the curry powder (the more the hotter.) Stir until the whole kitchen and beyond smells like curry. Set aside. When the meat is about as tender as you want, peel the potatoes, cut them into chunks and add to the curry. Continue simmering until the potatoes are tender. Take the pot off the heat and fish out the bay leaf and star anise. Stir in the roux carefully until it's completely melted into the stew and the liquid is thick and very brown. Return to the heat and simmer a few more minutes. At this stage you can dry roast another tablespoonful or so of garam masala and add it to the curry. At the last minute, add the optional frozen green peas, and stir - they should cook almost instantaneously. Serve immediately. There are two ways of serving curry in the "yohshoku restaurant" way. One is to put the curry in a sauce boat, and serve the rice separately. The other is to put the rice on the plate, and cover just one half with curry, You can of course just pour the curry right on the mound of rice. Usual garnishes are fukijin zuke, a sweet mixture of mystery pickled vegetables, and rakkyou, small pickled shallots. Other garnishes include chutney and grated cheese. I don't go to the trouble of grinding my own curry and garam masala, much as I'd like to in theory. I use pre-ground powders bought at a store that caters to Indian and Sri Lankan expats. The most common Japanese brand of curry powder is S & B, but the Indian kind is quite a bit cheaper and just as good quality. Garam masala is not commonly sold in Japanese groceries anyway, but it is of course in Indian groceries. If you want it to be yellower, add some turmeric. If you want it hotter, add some chili pepper powder, or more curry powder. Instead of, or in addition to, the grated apple, you can add some chutney, a tablespoon or so of honey, Worcestershire sauce, ketchup, and even a bit of soy sauce or miso. 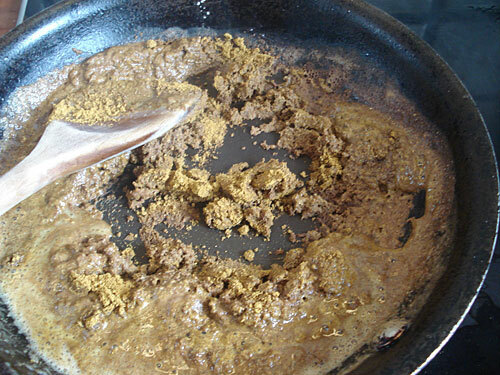 If you are using a curry base instead of making your own curry roux, just add it in exactly the same way near the end of the cooking process, making sure to take the pot off the heat first. If you have the block that looks like a chocolate bar type, break it up into smaller chunks and stir in to the stew mix until all is melted. The bagged powder type melts in faster. The curry should not be stewed for a very lengthy time after adding the base or spices or the flavors will dissipate somewhat. Many Japanese housewives individualize their curries by combining two or more commercial bases. Pork curry is made in the same way as beef curry, but you may want to try making the curry a bit hotter (by adding more curry powder or chili pepper powder). Chicken curry is best made with the dark meat parts (thigh works great). I also prefer to take the skin off first - curry-stewed chicken skin is not that nice. The stewing time for chicken curry is shorter since you don't want the chicken to get dried out. If this all sounds like too much work, you can still make a quick and easy curry using ground beef or other ground meat, and a commercial curry base. (Commercial curry base blocks are so big because they have a ton of flavor enhancing ingredients in them already.) Adam Kuban has posted a quick and fairly easy method for making a curry this way, though I would recommend sautéeing the onions a bit longer than he does, and adding the potatoes somewhat later in the process. If you are in a huge curry..I mean hurry, you can buy readymade curry in a pouch. They vary quite a lot in quality so try some until you find a brand you like. You can omit the meat and use oil instead of butter or ghee, and have a vegetarian curry. If you want some protein, try a can of chickpeas. Cooked soy beans also fit very well. You can go the TVP - quorn route if you like too. Or go for an all-vegetable curry and add more carrots, or some sliced eggplant (aubergine), cubed turnip, etc. Curry freezes and reheats very well, as long as you leave out the potatoes. Frozen potato turns into a mealy, watery, inedible mush. Just add some boiled potatoes to the reheated curry. Since it does take a long time to cook it does make sense to make a big batch at a time and freeze extra for quick meals in the future. Submitted by maki on 2007-02-06 14:43. Did you happen to see the urawaza video on browning onions faster? After slicing the onions, you put them in a bowl and sprinkle it with salt. Then you mix it up and and let it sit for a while and drain the water out every once in a while. I think in the video, it took at least 1/2 the time (if I remember right). Curry fan, I do add a pinch of salt to the onions though I don't put them in a bowl and toss. I remember watching that urawaza video, but I don't remember the details. Maybe I will try the tossing with salt trick next time...though I do wonder like you whether some flavor goes out with the liquid or not. Thank you for this post on making Japanese curry from scratch. I have scowered the internet for Japanese curry recipies and they always start with, "Buy a box of curry roux... ". Blech! Why feed the corporate machine when we can stick-it-to-the-man by making our own roux. Kudos to you for raising the bar. But... what I REALLY would like to know... if you know... what is the secret blend of 15 spices (or up to 20 according the to Village Voice article) that define the flavor of Japanese curry? I make my own curry powder (Indian) with which I flavor my udon and various cuts of meat. It is delicious, but it does not remotely resemble Japanese curry. I am at a loss. Can you help? It got a bit long for a comment so I've written it up here . I think it would need some experiementation but it's a starting point anyway. Have fun! A recipe for rice curry on a food blog?! What next, yakisoba? Omurice? Ketchup spaghetti? Rice curry is the chicken fingers/mac & cheese of Japan. It exists solely to feed picky children. And mom can feel like she's "cooking," even though the core of the dish is a trans-fat filled chocolate bar. Making it from "scratch" reminds me of the gourmet mac & cheese boom of a couple years ago. So, I found this in a Nitty-Gritty Cookbook from 1969. This is after much experimenting and modification. 2.Brown the chicken. While doing this, bring the beef broth to a near boil in a 10 quart pot. Depending on how big the veggies and chicken come out to be, you might need a bigger pot. 3.When the browned ingredients are done, put in the broth. Stir well. Bring back to a near boil. 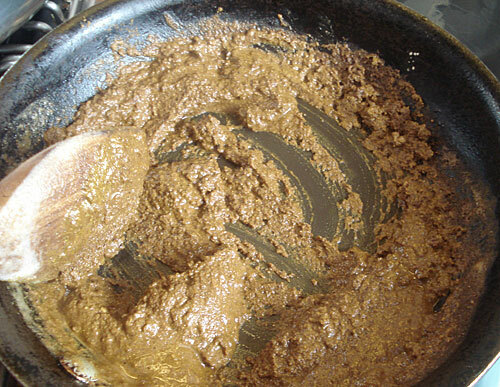 In a small bowl, blend curry powder with cold water, enough to make into a smooth sauce. In a different small bowl, mix the cornstarch with a small amount of cold water, enough to make a smooth, thick sauce. Place curry powder in broth and stir in completely. Put chutney, ginger, apple, and soy sauce in. Stir in between each ingredient. Boil for about 30 minutes or until the potatoes are tender. 4.Turn down heat and add cornstarch. Stir until thick (like your spoon is standing up in it). Take off heat and shred in Gouda and buttermilk. Add salt just before serving. Serve over rice. Some notes: I live near a farmers market and a Asian supermarket, so things are a bit easier to get. Most things can be omitted or substituted. gouda and buttermilk in curry.... sounds odd yet oddly compelling. Thank you for posting the recipe! Not entirely sure how I feel about this recipe, though I admit I like to just use instant and add tasty accents, otherwise I just make thai/indian curry. .. anything wrong with omurice, yakisoba, or for that matter mac and cheese or chicken fingers, if they are done right! Or curry rice either. Just because there are cardboard box versions of a food doesn't mean that it's inherently bad. I'm no food snob - if it's good, it's good. Hi, first of all, I love your blog! Second.. although I do appreciate you taking the time to outline a recipe for made-from-scratch curry, I was wondering if you could help me with the boxed curry I have, since I don't necessarily have a lot of time to cook these days; also you seem like just the right person to ask. :) I have a few packages of S&B Golden Curry, and I've seen various recipes floating around, but most of them say to use the entire bar of the mix, (all of the roux?/the whole package?) and then recommend freezing it for later because it makes such a huge batch. My question is that I only want to make enough curry to feed 1-2 people at a time, preferably two, so how many smaller bars/(roux?) of the curry mix should I use? I was under the impression that if the whole box was five small bars/(roux? ), then I could make enough to feed 2 people using just one small bar/(roux?). Hmm.. I guess basically what I want to know is how much curry could I make by using just one small bar piece/(roux?) instead of using the whole package/big bar/all five small bars. Thank you so very much!! Eve, S&B curry comes in two sizes. If you have the smaller one (100g size, or 3.5 oz) the pack says it should make about 6 servings, so for practical purposes half the box should make enough for 2 people. The big 200g box should make 12 servings they say so you need 1/4th. Keep in mind you'd need to reduce the amount of moisture in the dish accordingly too or you'll end up with a very watery curry. What is garam masala, and could it be omitted or replaced? I live in a very, very small town, far from more civilized stores - it's a miracle we have mozzarella cheese! Garam Marsala is an Indian spice blend; not sure entirely what's in it. McCormick has a "Gourmet Collection" of spices on the market, and you can buy Garam Marsala from them. I got a bottle of it from my local Wal-Mart. I live in a small town as well. Garam Masala translates to "warm spice mixture". It is a mix whose composition varies according to the particular dish as well as to the locale in South Asia. Garam masala is used in at least 2 forms in stewed/braised dishes: first, the whole spices are stirred into hot fat at the beginning of cooking, say after/before browning onion. Finally, a few pinches of the powdered mix may be added at the end of cooking, to "wake up the flavors". In some areas, this final powder is prepared after light roasting, but in others, e.g. many parts of Punjab, the garam masala mix is not roasted. Let us start with a simple garam masala from West Bengal: whole green cardamom, whole Indian cassia bark [a type of cinnamon] and whole cloves. This combination is often supplemented with Cassia leaves [Cinnamonum tamala leaves] and whole cumin seeds, which are gently sizzled in hot oil or fat when cooking commences, to release aromas into the cooking medium. The cardamom pods, cassia bark, and cloves can be ground in a dedicated coffee grinder, without roasting, to create a Bengali-style garam masala. When you add whole black peppercorns to the above formula, you come close to the garam masala used by the Parsis. In Pakistan Punjab, a popular garam masala for certain meat dishes might include whole cumin seed 6 parts, black pepper 1 part by volume, a couple of pods of BLACK cardamon, peeled (seeds only), a touch of cassia bark to your taste and a hint of grated nutmeg, all ground fine in that coffee grinder. Other flavors might include Siahzeera, a black caraway-like seed, and even whole coriander. A good prepared garam masala in the Punjab style is the MDH brand. A good brand from Pakistan is National brand, and Laziza, followed by the commonly available Shan. I mentioned the details, just in case you wanted to get the whole spices which can be used for baking, Christmas cookies, special breads, and other cooking. They are much cheaper when purchased from South Asian mailorder sources in 4 oz. sizes, but only if you are going to use them all up!! The term "garam masala" means 'heating' spices, or hot spices. Different cooks blend their own combination of spices to make their own unique garam masala. The heating spices are cinnamon, cloves, black pepper and black cardamom, and typical garam masala is an equal mixture of these 4 ingredients, but sometimes cooks use some of the 'cooling' spices of green cardamom, Indian bay leaf, and fennel (saunf). More elaborate chefs also use a wider array of spices, such as dried rose petals. It is best to grind your spices fresh just before using, and it is best when using whole spices, such as whole cloves, stick cinnamon, peppercorns, etc. If you grind or mix more garam masala than you are using at a time, you can store the remaining garam masala in a tightly-sealed bottle in a refrigerator for up to 6 months (best if used within 3 months). I find it amazing that last year around this time I was looking to make homemade tofu and found your site. This year I've been wanting to make my own curry roux and here you are again. Whats next on the menu... taiyaki? Anyway thanks for the instructions again, I can't wait to try this one now. Well today I finally made my own curry powder. I followed the ratios given, well kind of and came close to the taste I was seeking. Today was also the first time I added apples to the curry. The apples make it sooooo good. Thanks for all tips. i have forever been searching for a recipe for japanese curry, this is gold my friend. I love your recipes here Maki-sensei and I was just wondering if you would happen to have already calculated the calories on this one. I need to keep track of my meals for a class at my college and just wanted to know if you had it on hand. I can do it myself but if you have it already I'd really appreciate it. I really haven't calculated the calories for curry...because it is fairly high in calories because of the roux and so on, so I regard it as a 'treat' dish. It shouldn't be too hard to calculate though. hi..i wanna ask you all..i wanna make japanese curry, but in my place..curry roux and curry powder is not available here..can anybody help me how to make the curry? You mention cooked soybeans ...something I always add (in lieu of, or in addition to the frozen green peas) is edamame. Great way to add flavor, protein, fiber, and other vitamins. I can't believe after a ~year, I'm just now stumbling across this recipe here. Thanks! Hi, I've been reading your blog for a while. I've tried a few of your recipes, and I love them! I have a friend coming to visit later this summer, and she has never tried curry, which is one of my favorite foods. I want to make it for her, but she has celiac disease, so she can't have gluten. What could I substitute to make this recipe gluten-free? Would gluten-free flour or rice flour work instead? I don't have any experience with gluten free flour, but I would try this: instead of making roux, just saute the spices in oil and add them, and near the end of cooking add gluten free potato starch, rice flour or other thickener (kuzu would be good though it's a bit expensive, or arrowroot) just to give ia thicker consistency. Don't skip the sauteeing spices part in any case, to bring out their flavors and to add a toasty quality. I know this is late, but I am celiac, and I have indeed made a roux with rice flour. It works pretty much the same way. Ok, I'll try that. Thanks a lot! I tried your recipe with the S & B base and I cannot believe how much difference adding extra onions, garlic, ginger and grated apple makes! I used to be lazy and just use carrots and potatoes with chicken, omitting even onions. I'm now obsessed with making the perfect curry, so thinking of making it with the garam marsala and curry powder rather than the base, and trying extra things like instant coffee powder. It was rather sweet just with your recipe, but I'm still keen to add a little sweet potato, and maybe even miso. I might also vary it a little, make a vegetarian curry and stir in the meat before serving as I tend to use chicken. I use a pressure cooker so the vegetables are tender in next to no time. The slowest step is actually sauteeing the onions. Which cuts of beef and pork do you recommend? I haven't had good results with blade steak, probably because the pressure cooker works too well. Skirt steak would probably be the same as chicken, requiring minimal cooking time. I haven't tried pork at all so not sure which cuts to use. Now, if only I can get tonkatsu right, then I can do kare katsu, my absolute favorite. A Japanese curry is basically a stew, so (especially) if you are using a pressure cooker, try using chuck or shank (if you look at this illustration, aim for the parts of the cow that move around a lot, i.e. the neck and legs), which have the most gelatinous parts. The same goes for pork. But for a katsu kareh you will want to use a nice filet or chop for the katsu since you won't be stewing it of course. Have fun! Adding carrots 30 minutes after? Absolutely great recipe. I've been a long fan of Japanese curry and though I have always used S&B or Vermont, I can appreciate the depth and from-scratch approach you have taken here. I believe I will try this from-scratch, but unsure if I will carry it out every time I make curry for reasons of convenience. The box-brands, when purchased from the right company, are just as delicious and have been proven to please the crowds. Why do you add the carrots about 30 minutes after the addition of water and other ingredients? I've always put carrots first. This way, since they are the "hardest" ingredient, they make for a good measure of when the other ingredients have become tender. I put potatoes shortly after carrots as well, and there's no loss of shape or melting-effects occuring to either vegetable. Please let me know why this maybe wrong or ineffective when compared to the approach you've mentioned here. I'm always looking for ways to perfect this recipe, everytime I make it! I've been visiting your blog for a while, but I can't believe I hadn't checked this post before!! This is awesome!! Indian technique for frying onions. French Roux. Plus Japanese ingenuity. It is THE recipe I've always had been looking for. Thank you very much! Most recipes out there (even those in japanese) call for commercial roux. And they're often nowhere close to the taste of the stuff from some of the great yoshoku restaurants in Japan. This one definitely is! Instead of using the stock cube I tried using some demiglace. It turned out overwhelmingly good. Maybe I'll omit the demiglace next time. The following is adapted from a recipe I got while living in Japan and I've always had good luck with it. It has a pretty authentic "box curry" flavor and the ingredients are readily available, if not already in your kitchen. Thank you for this. Looking for a cheap dinner and knowing I had plenty of rice at home I grabbed a box of S&B curry raux. Got home, looked at it and realized "Holy crap, what do I do with this?". My first thought was "I'll ask Maki." and sure enough I know what to do with it now. Here's hoping my pared down for two version turns out alright. I made my first batch of curry from this recipe awhile ago so thank you for posting it! now I can't get enough <3 Dying to make curry bread now that I see you have a recipe for that, too! I'm a fan of Japanese style curry, I first had it on a trip to Japan at lunch on the way to the Hitachi Yokohama works, and I learned it was the same my mother made in 1950-53 in American Samoa, not sure what she put in it, onion, lamb from New Zealand, garlic, local vegs. served on rice. After my trip, had it at The Curry House in Torrance, CA, and noticed the packages of S&B Golden Curry mixin the Asian Food section at Ralphs, tried it, liked the results. One package is two or three meals with rice. The original mix had Tallow, beef fat, now is Palm oil on the label. The latter does not taste as good. Just ordered via web, 6 (mulipack) of medium. I use round steak, cut it into narrow strips, cook it with the onions. Cook the carrots, potatoes in a saucepan, the meat/onions in a 10 inch skillet. Add the water, simmer. 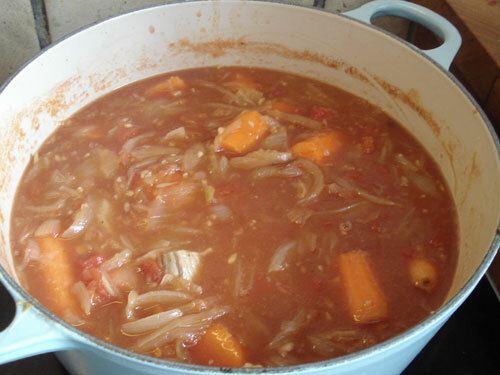 At the end, breakup the block, simmer til disolved, stirring, then add carrots/pots, simmer until it starts to thicken. Served over steamed rice, even my Illinois Polish Italian wife likes it. Got to try this one, but should be curry this weekend. Want lamb, dark chicken will work. - puma former Angeleno now near I-80. This recipe is just awesome. I made a vegan version with tvp chunks and it turned out perfect! Thanks Maki, you taught us well. Thanks for this recipe,Love the page!!! I live in Puerto Rico and sushi and green tea is very popular. Even in the supermarket that they sell these utensils for making sushi, and they even sell asian green tea at $5.00. I Wanted to make curry for like 3 years. Where I live the only sell curry powder and not the curry blocks. This was my first time cooking Curry Rice, and I've gotta say, it was very filling, and really good. I didn't have everything, so I treated it a little like I would a stew. I didn't have tomatoes, star anise, garam masala, apples, or ghee. And I used garlic and ginger powder, cause I hadn't used mine in awhile. It turned out pretty good without the extra ingredients. I wondered if they sold this stuff pre-made. Cause it seems like an awful lot of work for how much the japanese seem to eat it. I may be overlooking something really obvious, but I've read this through a few times and I can't find it, could you tell me how many people this recipe serves? I'm at university at the moment and there is no freezer in the communal kitchen so I don't want to end up making a meal for 10 when there's only 1 of me! It says right under the title of the recipe itself, before the list of ingredients, 6-8 servings. My husband has been craving his mom's Japanese curry... I have finally managed to make some other decent Japanese dishes that remind him of his mother's home cooking, but it is difficult to do because I have no asian roots and there are not very many specialty markets here. It is difficult to find authentic ingredients! Thank you so much! Try some sun dried tomatoes for umami and sweetness instead of apples and canned tomatoes. Sun dried tomatoes stay chewie even if cooked for a longer time and they add this nice sweet flavour..much better than canned tomatoes. Sun dried tomatoes can be thrown directly into the pot with the stock, you do not need to rehydrate them..if you do they will be softer and give more colour to the stew. It does not change the flavour. i love your blog. 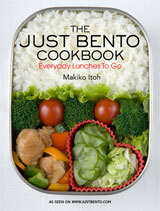 it really teaches me how to cook good japanese food. thanks. i hope i can succeed in cooking karei raisu. your okonomiyaki looks great too. I am adding it in to my to-cook list. Thank you so much for the made-from-scratch curry stock recipe. Recently, I learned that I have acquired a severe MSG allergy, and all of the commercial curry bases seem to use it (as do a depressing number of general processed foods). As you can imagine, I've been so busy learning how to cook everything from scratch that I hadn't found time to get to curry rice yet. You've saved me a lot of digging through old cookbooks, which is about the only place I thought I'd find such a recipe from scratch. Your recipes are wonderful & show how much hard work you put into them. Have you ever tried making Hokkaido style white curry from scratch? I've been able to locate almost no information on this variation, other than it is different from cream stew, & is often served with saffron rice to accentuate the white color. So, there is little I find to work with to start to experiment. Any ideas? I usually cook beef curry in the slow-cooker and add in the curry base just before serving. But with your cook-from-scratch recipe, I'm going to try it th slow cooker way and see how things turn out. Thanks for inspiring! Delicious! I made a chickpea variant in my slow cooker, and the only thing that needs changing is I think I need to precook the chickpeas, they're still quite crunchy. iv been looking for a good recpie all day because i plan to cook this today for my bf. i automaticly though japanese when i thought of curry for got that india made it which explaines why iv been having trouble. Either way im so glad you put this hear and am totaly checking the rest of your recipies!. after i make it (and if i do it right lol) im posting a link to your blog on mine so my friend can find it. Also i wanted to say thanks to you posters yall asked the questions i wante to ask alrady ...lucky! Thanks for sharing this. I have been wondering if it is possible to make Japanese curry from scratch as the commercial ones indeed contains more artifical flavorings. Looks like everyone has finished posting but I'd just like to say what a great recipe this is! Thoroughly enjoyed it. Also like to mention that every curry I make I always add in a boiled egg for each person (or 2 for me) towards serving time. I just love eggs with curry. Thanks alot I can make this for my Japanese friends and see if they like it! Thanks again! It looked like a very delicious beef curry. I never try this kind of recipe myself. Well, I'll practice this recipe at home soon. I wish I won't fail. Thanks. I have to say that I had no idea about Japanese curry until I started watching anime more regularly, and became curious about how different it was from Indian curry. I really love this recipe, although I replaced the beef with baked tofu, use only 3 TBS oil for the batch, left out the star anise, and added a little ketchup, brown sugar, and miso paste. I make this about once a week and I am able to get nine 1 1/2 cup servings out of it. For those who were wondering, it is possible for this to be healthy, although the sodium is on the high side unless you use a lower sodium bullion. For the version of this recipe that I use it is only 385 calories for the cup and a half amount, and with about a cup of cooked rice it is plenty enough for an easy meal. My only problem now is wanting to use the curry in steamed buns. XD Thank you SO much for this recipe! i just wanted to say this was reallllly delicious thank you for the recipe! I just finished a plate of this after cooking it for the past 3 hours. It was worth the time. My boyfriend (who is indian and loves curries) says its something I should make to serve to company. He really enjoyed the different flavor of the Japanese curry. Also seems a bit healthier than a lot of indian curries, no heavy cream or sticks of butter! sooo glad i found this! we usually use those nasty cube's...ran out & have not a dime to my name till july. My question is kids are VERY questionable on the tomatoes. can i leave them out?would it tast emore like teh cube's? if so what do i need to replace with? I do plan on cooking a huge batch in slowcooker(minus potatoes0 to freeze & steam potatoes as needed. Also no apples but i do have small containers of no suger added natural applesauce....would this do in a pinch? sorry for all the questions!Tahnks in advance!! I've had considerable success with this recipe, but I wonder why it's necessary to make the roux. What will go wrong if you just throw curry powder into the pot? This recipe rockets you right up to the "Top 3% of Awesomest Humans on Earth"
Anyone know what the garnish is in the photo? I recently went to a place in Portland that serves this dish and has a garnish that looks very similar to what is in the photo. I'm very interested in making this dish and loved the little red addition that was on my plate. The accompaniment is called fukujinzuke (福神漬け). You can find it in any Japanese grocery store, in little packets. That's what I thought, and what I bought at the local Asian Market, but when I opened it, it was no the same as what I got in the restaurant. What I bought was like pickles, and possibly other veggies, but in the restaurant it was much more red than the greenish look of the pickled veggies I got. Do you have any suggestions for making a gluten-free roux? Maybe 1 tablespoon cornstarch and the rest white rice flour? That way it can thicken but not be clumpy (cornstarch thickens, but if it isn't dissolved in water first, it is lumpy). Also, we are allergic to apples. What kind of taste does it give to the curry? Sweet? Tart? Maybe I can use something else, like a pear or simply a tablespoon of sugar? I finally used S&B Curry Powder instead of the ready made curry base. And boy, what a big difference. Words cannot describe how wonderful the curry tasted. I will never ever go back to the ready made curry base. Instad of star anise? Tomato? Hello first i wanna Thank you so much for all your recipes I've tried a few with acceptable success (my lack of cooking skills so evident hehe) and I'm pretty happy 'cause I could make food that other people can actually eat :') so thank you very much maki. Re: Instad of star anise? Tomato? Thank you very much :3 here in México is hard to find canned tomatos that don't have already Italian spices and harder to find cause a live in a very small town but I'll go to Walmart hehe maybe they can have some canned ones there :3 thank you again!!! I’m from Norway but i love my sushi and curry, have yet to try miso soup but will try it soon and then try to make it, shouldn’t be to hard. Anyway, i LOVE the curry i make (thanks to a dear friend) but instead of using instant curry….thingy, i make it from scratch. I make my own paste which contains flour, liquid butter, pepper, hot curry powder (or the mild normal one if you don’t like it to hot) chili (optional) garlic powder, soya sauce, Worscestershire sauce and some ketchup and then mix it together into a fine paste, i chop up carrots and potatos and throw it into a big pot, add water so it is abit more water then vegetables…i fry the meat (chicken, pork or the meat you like to use) along with red onion and put it into the pot as well, i let the whole pot cook for about an hour, remember to taste as you go so you can adjust the taste and the strength of the curry. It takes some time to do it my way, but god does it taste like heaven. The key to getting a dark, rich sauce is 1. cook the onions until they are caramelized and soft enough to completely disintegrate in the sauce after cooking, 2. brown the flour for the roux. Pork curry does turn out a bit lighter than beef though, since the meat does not caramelize on the surface as much. Thank for your reply. Most of the Japanese restaurant in Sinapore selling this curry sauce together with pork or chicken cutlet. Is it the same way of cooking if without the meat in the curry? Yours curry rice make me hungry! hope i can achieve consistency creamy sauce of this curry. I'm really excited to try out this recipe, but I have a problem. I'm going to be starting a month long liver cleansing diet very soon, and three of the ingredients here are on the list of foods I'm not supposed to eat: Beef, Tomatoes, and Potatoes. I'm not too worried about the beef because I can use Chicken instead and I've read that rutabagas can be a good substitute for potatoes. My question is: Is there anything I can use to substitute for the tomatoes? There really is no good substitute for tomatoes in this recipe. I would consider waiting until your cleanse is over to try the curry. 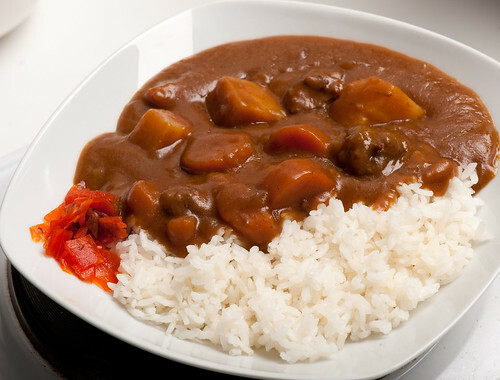 Japanese curry is tasty, but with the fat in the roux and everything it is not exactly a health food either. A common ingrediant in classic curry, Indian, is a little bit of high quality dark choclate. I made this last night and it was a hit with my family. I added soy sauce to make it more salty. I'm a terrible cook and your recipes from you site and book has really helped me with feeding my family delicious nutritious and budget friendly foods. My picky 18 month old eats just about anything I cook when it's one of your recipes. You're amazing. Truly thank you so much! Some of the people on this comments section are over thinking this curry thing. I don't recommend making your own curry sauce. Almost all Japanese people use the packaged roux. It's an easy, no brainer comfort food dish. The roux base from the box will give it the authentic Japanese taste as opposed to tasting like the Indian variety. My favorite brand is House Vermont mild - made with apples and honey. I'd like to make some Japanese curry, but my husband is allergic to onions. What would you recommend I do? Just omit it and sauté in butter? That's a bit difficult...if he's ok with leeks, try that . If not, increase the amount of garlic, and maybe add some shredded carrots instead of the onion and saute them very well, and simmer until they're falling apart. Genki? Doomo arigatoo for this city recipe! Do you suggest using the vegetarian version of your recipe if you're making katsu-curry? I've used S&B curry in the past and wanted to get your take on making katsu curry from scratch. The vegetable version should work fine. You can leave out the potatoes if you like, since katsu curry is pretty high in calories anyway. Yes, Milk. Every Friday curry is served at the Japanese Navy with a Glas of Milk. Thank you very much for this recipe, i will try it out soon. Thank you so much for for this, and all of the other recipes and lessons on this site. I had never tried Japanese Curry Rice before, but it has become one of my favorite savory dishes. I think I now understand that person who said, "Curry is to the Japanese what pizza is to the Americans: they did not invent it, they merely perfected it". I especially like the way you present your lessons. You not only provide the prefered recipe, but you also go into great detail about optional methods and ingredients. This is a huge help to me and I am very grateful for all of the extra effort and love that you pour into your recipes. Please get well soon and thank you for all of your hard work.